VERY FINE. 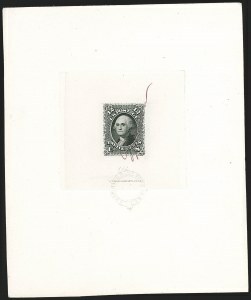 ONLY ONE SET OF THESE "SPECIMEN" DIE PROOFS WAS PRODUCED FOR THE 1861 ISSUE. THIS 3-CENT PROOF IS THEREFORE UNIQUE. 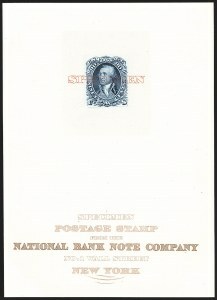 A similar set of die proofs is known for the 1870 National Bank Note Co. Issue. That set is also unique. VERY FINE. 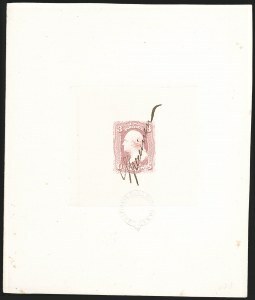 ONLY ONE SET OF THESE "SPECIMEN" DIE PROOFS WAS PRODUCED FOR THE 1861 ISSUE. THIS 12-CENT PROOF IS THEREFORE UNIQUE. VERY FINE. A SPECTACULAR COMPLETE SET OF 1861 ISSUE LARGE DIE PROOFS WITH "SPECIMEN" OVERPRINTS AND NATIONAL BANK NOTE COMPANY IMPRINTS.